We heard about Daniel’s story from our friends at J&J Sports/Got Baseball Cards and we were very moved by it. When we heard Daniel would be attending his first-ever National Sports Collectors Convention, we wanted to make it special for him so we asked his shop owner to bring him over to the Upper Deck booth! We provided him with the essentials he would need to enjoy the show. What we didn’t know is what he would find in the packs he was opening. Daniel didn’t waste any time and cracked them right at the Upper Deck booth. 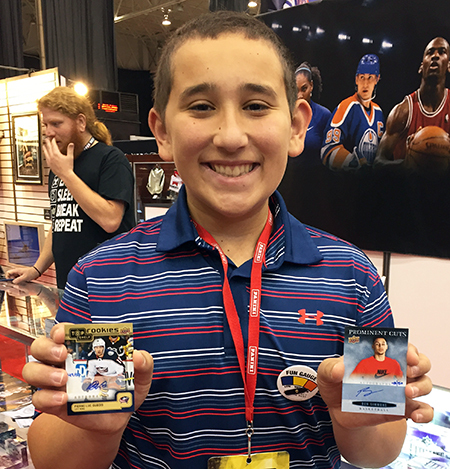 He was excited to score an Upper Deck Top Shelf autograph rookie card, but he loves basketball and to unwrap a pack that included a Ben Simmons autograph made Daniel’s first National Sports Collectors Convention one he will never forget! The Upper Deck team was so happy to make this a memorable trip for Daniel and we appreciate the staff at his local card shop for bringing him by. When youngsters have a lot going on, especially with medical issues, trading cards are often a nice distraction from the stress that comes with the challenges of the day. When you discover something special like Daniel did, the hobby becomes even more exciting! Awesome sorry, I know collecting cards is so big for kids. My daughter Brooke collects and loved the great treatment she got at the Summit Show in Edmonton from Upper Deck. She’s already talking about next years show and wanting to get a box of MVP 18-19. Way to go Upper Deck … first class as always!